If you can cast your minds back to the beginning of 2015, I made a pledge here on the blog to make switch to only using and buying cruelty free make-up and beauty products. I can happily report almost 18 months later I’m still going strong. 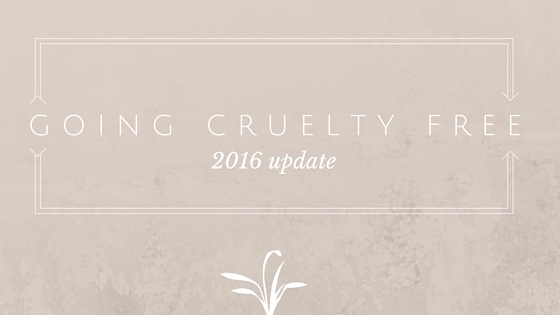 So I thought it’d be nice to give you guys an update on how I’m managing my pledge as well as a reminder on what exactly cruelty free means to me. Despite the fact it’s taken me nearly 18 months to finally use up or bin most of my non-cruelty free stash, making the switch is definitely not as hard as everyone made it out to be. Now that I’m in the mindset to buy cruelty free it’s made shopping for my skincare and beauty products so much easier. And if there are brands I come across that I’m not familiar with, it’s pretty much second nature now to do a quick double check on their animal testing policies. I’ve also extended out my pledge to buying things like shampoos, body washes, and skincare as well which wasn’t much of a stretch on top of just make-up. Personally Superdrug and Holland & Barrett have become high street saviours for me to try and find products. Superdrug’s own brand in particular are absolutely fantastic for decent quality beauty and skincare products when I’m desperate for something super cheap. The one product I’m still finding so hard to find is a decent antiperspirant. There’s a whole host of cf deodorants (some I’ve tried with various degrees of success), but as someone who finds sweat pretty uncomfortable (…TMI? ), these just don’t cut it. So for now its the only product in my stash that remains not cruelty free. In terms of make up I’ve definitely found this the easier part of choosing only cruelty free. I’m pretty much ‘set’ with the products I use on a daily basis but I am on the hunt for a reasonably priced foundation (liquid, powder or spray) for my skin tone. So far Lush’s colour supplements in Dark Yellow have been the closest I’ve gotten, but as with a lot of Lush products the little pot is pretty pricey, even if I do try and stretch out it’s use by combining it with my moisturiser. Despite this little blip in my stash, by far my favourite part of making the switch has been discovering some amazing independent cruelty free brands, that are often so much better quality than the usual Rimmels or Revlons, and so much more to cruelty free beauty than Lush. One thing I always reiterate to people who are considering going down the CF route is that it doesn’t limit your choice of products it merely opens up a door to so much more. As I mentioned my entire mentality when shopping for make-up, skincare etc. has completely changed. No longer am I just buying a lippie on a whim, I don’t have to deal with the frustrations of trying to buy something from a new Mac collection (though if they eventually do decide to go cruelty free, I’m so screwed), and, yes, I do feel a little bit pretentiously superior when I tell people ‘Oh I can’t buy that, it’s not cruelty free’ *yay for problematic middle class privilege*. Do they have a certified Leaping Bunny Logo, PETA’s cruelty-free logo (USA, or the Choose Cruelty-Free logo (in Australia) printed on their products. Cruelty Free Kitty has a fantastic guide on what to look for and what the logos look like as some companies do like to be a bit cheeky and come up with their own versions. Do they appear on Peta or Cruelty Free International’s CF lists of approved brands. Easiest way to check is to Google it but I’ve also just downloaded Cruelty Free International’s app, which has made looking up this stuff so much easier, it even lists of cruelty free subsidiaries with non-compliant parent companies. Do they have an animal testing policy which includes the phrase ‘unless required by law’. This is usually a HUGE red flag for me, at which point I again make sure I do a bit of a Google and check off my next point. Do they retail in China (and/or any other countries that require animal testing by law before retailing). Send out an SOS to the #cfbloggers community on Twitter and Instagram. All of whom are FAB and the hashtag has been a quick lifesaver if I’m trying to find out if anyone else has used their products. I’ve also find CF bloggers tend to be a little more honest when a product just doesn’t work for them, so their blogs have been a fantastic resource for me in the past few months. That’s my journey, how about you guys? Have any of you made the switch recently and how are you getting on with it?